During the Afghan cricket match, a man who was wounded in a surprise attack at the Jalalabad, Afghanistan Spinghar Ground Cricket Ground, received treated in a hospital this Saturday. The status of his condition is currently unknown but recent reports have said that the man is in stable condition. However, the devastating side of the attack has been revealed as eight people were killed during the match while dozens of others have been wounded with some cases being critical and others being minor. 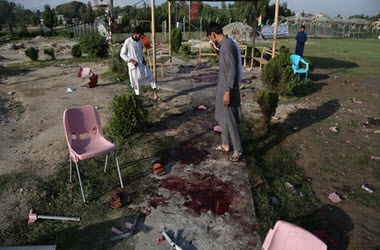 The attack showed itself as a series of blasts during the cricket match that was being held in the eastern Afghanistan area, according to officials. The blasts were reported to happen after the evening prayers on Friday at the stadium that was hosting the cricket match. This coincidentally, also happened at the start of the holy month of Ramadan, according to Sohrab Qaderi, a member of the Afghan provincial council. A spokesman for the Nangarhar Province governor, Attaullah Khogyani recalled the order of the fatal damage. One bomb that was deceptively hidden under a platform typically used by sports announcers went off around 11:30 p.m., which was the time during the break in the match while a few speeches were being made. The first bomb was followed by two more devastating blasts at the gates of the stadium. However, it is still unclear if these bombs were strapped to suicide bombers or were planted, though one of the bombs was attached to a motorized rickshaw. He summarized that currently, there are currently only eight deaths and forty-five others were wounded. Many suspected this bombing was planned by the Taliban, though the leader of the infamous group, Zabihullah Mujahid, denied all claims that the group was involved in the fatal attack. The match that was taking place at nighttime, which is a normality due to Ramadan taking place, as it allows for people to fast freely during the daylight hours. This match was dubbed as the Ramadan Cricket Cup – and many of the patrons were highly anticipating this game. The Afghanistan Cricket Board chairman, Atif Mashal, who is a popular figure in the sport of cricket, went to Twitter to express his disdain for the entire attack. Mashal stated that since cricket was introduced to the country, it has been a sign of happiness, pride, and peace for the fans and the players. He went on and stated clearly that these attacks were against everything cricket stood, along with being against humanity as well. It should be noted that the number of dead were not only fans who were fleeing, a few officials, unfortunately, perished as well. The organizer of the match, Hedayyatullah Zahir and a Laghman Province official, Nekmal Waziri, were some of the people who died. Along with one recorded death of a child, who age is currently unknown.